Asserting what he was sure was his right, Charles VIII of France wished to lay claim to the Kingdom of Naples and went there in 1494. To back up his claim, the king brought along an army of 18,000 men - along with about 40 cannon. The first to stand in their way was Florence, but upon hearing news of the fall of the little fort of Fivizzano, Duke Piero de Medici acquiesced to Charles. Other walled defenses capitulated. Rome followed the example of Florence. The Kingdom of Naples was next. 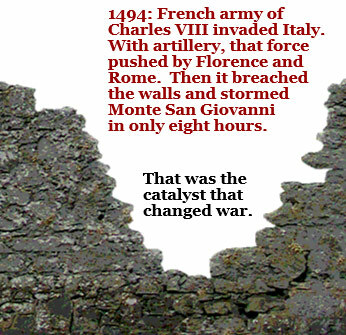 The border stronghold of Monte San Giovanni had previously withstood a siege for seven years. French cannon, however, quickly breached its walls. French foot surged in and slaughtered its garrison. All within in a mere eight hours. The speed and ease with which the French took one fortification after another astonished and profoundly shocked Italians and then other Europeans upon hearing the news. In 1498 the Senate of powerful Republic of Venice issued: "...the wars of the present time are influenced more by the force of bombards and artillery than by men at arms..." and next had that republic acquire firearms as quickly as possible. In 1519, Niccolo Machiavelli summed up the French effect: "No wall exists, however thick, that artillery cannot destroy in a few days." But! By then Machiavelli was already being proved wrong.